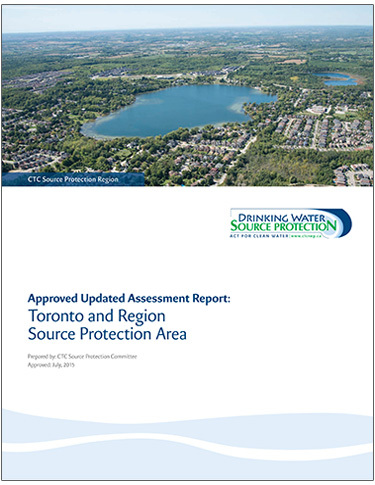 This report describes the physical features and water resources within the Toronto and Region Source Protection Area jurisdiction. Using approved provincial methodologies, it delineates vulnerable areas, and assesses specific activities that pose potential drinking water threats within these vulnerable areas. Where drinking water threats have been identified as significant, the Source Protection Plan outlines what policies apply. Chapter 2 describes the physical and human characteristics of the Toronto and Region Source Protection Area jurisdiction, including its physiography, geology, hydrology, terrestrial and aquatic ecology, human characterization, water quality, and water uses. Chapter 5 describes how drinking water threats and issues were identified and lists threats within Toronto and Region Source Protection Area’s jurisdiction. Appendix C documents the methodologies employed in the development of understanding the water supply and demand across the Toronto and Region Source Protection Area . The Lake Ontario modelling identified 19 locations of significant drinking water quality threats related to Lake Ontario intakes within the Toronto and Region Source Protection Area. In addition, 10 significant drinking water quality threats from activities within the Toronto and Region Source Protection Area have been identified affecting five Lake Ontario intakes outside the Toronto and Region Source Protection Area. With respect to groundwater, 456 significant drinking water quality threats have been identified in this Assessment Report. No existing water quantity threats have been identified for the WHPA Q1/Q2 in York/Durham. No drinking water quality issues were identified in WHPAs of municipal wells within the Toronto and Region Source Protection Area.